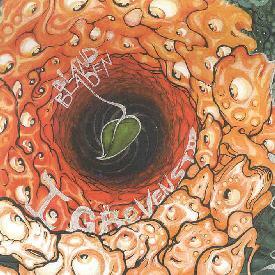 Bland Bladen - "I Grevens Tid"
Bland Bladen are a quartet from Malmö, Sweden who play a KILLER instrumental brand of Space Rock that blends Ozric Tentacles, jamming lysergic Psychedelia, Trance, and Progressive Rock. The band consists of Solen on Fender Rhodes & keyboards, Sabana on guitar & sounds, Kaufmann on drums & percussion, and Dave on bass & fishmouth. I Grevens Tid is their first album and includes three tracks in the 12-13 minute range and one at 6 minutes. The set opens with "I Grévens Tid", laying down a cool psychedelic groove and the Rhodes gives the music a 70's prog-jazz flavor, while blending in more modern Space Rock stylings á la Ozric Tentacles. But the band stretch out nicely, transitioning through several themes, including a trippy Blues psych segment peppered with liquid efx and hypnotic floating atmospherics. "På Grön Kvist" is a heavily Ozric influenced tune that builds the pace and intensity to smokin psych-rock levels. "I Afton Trans" and "Dimland" include some of the most high energy trip rocking moments of the set. The music consists of searing space rock with hints of Zappa amidst the Ozric styled space vibe and old time kosmiche prog and heavy rock feel. The rhythm section on "Dimland" is particularly heavy, pounding away furiously while shooting alien synths and wah'd guitars wrap themselves around your brain. Absolutely mind-bending and the way the music evolves and builds positive energy and intensity they could have easily gone on for 20 minutes or more and never lost my attention. So chock another one up for the Swedes dear readers. This is 100% totally spaced out rock and prog played by a band with pure psychedelic hearts. You are commanded to check these guys out NOW! But don't take my word for it. For more information and to hear most of the album online, plus some cool live stuff, you can visit the Bland Bladen IUMA web site at: http://artists.iuma.com/IUMA/Bands/blandbladen.